Has the sewer system been acting up at your residential, commercial, or industrial property, and the temporary fixes are no longer working? If you answered yes to this question than it is time to come to terms with the fact that you need a major repair, complete system overhaul, or even a sewer pipeline replacement. Although this is probably not the news that you wanted to hear; when the sewer pipes are broken they need to be fixed in a more permanent manner. Otherwise, you are taking the tremendous risk of raw sewage, wastewater, and other sewer materials leaking out of the pipes and entering directly into the ground. This can cause a severe environmental hazard that the property owner is responsible for from both a financial and legal standpoint. In addition, the raw sewage, wastewater, and other sewer materials can back up into the pipes and eventually flood the interior of your property through the toilets, water faucets, and or drains. This can cause a dangerous health hazard to anyone that comes into contact with it. The good news here is that trenchless sewer repair is now available in St. Louis, Missouri. It is a non-invasive method that does not require the excavation of a long, deep, and destructive trench along the length of the sewer pipeline. In essence, the sewer pipes no longer need to be physically exposed in order to repair them. The technology was invented approximately fifteen years ago and Nu Flow Technologies perfected the process with the development of the Nu Drain Pipe Lining procedure. At this point, you are probably curious as to how it works. The Nu Drain pipe lining procedure relies on advanced plumbing technology instead of the old school excavation process. Instead of a long, deep, and destructive trench, only a small access point is needed at one end of the sewer pipeline. A high-tech machine developed by Nu Flow Technologies uses the access point to insert a felt tube into the existing sewer pipeline. The felt is saturated with a specially formulated epoxy resin material. Once the tube is in place it is inflated the wet epoxy resin will completely cover all interior surfaces of the sewer pipe. The tube is then deflated and removed from the sewer pipeline. Within a few hours, the epoxy resin cures in place. Once it fully hardens an impenetrable pipe liner or pipe within a pipe is formed. The new liner seals off any chips, cracks, small breaks, and rotten spots. It also prevents any further damage from occurring in the future. The new liner will last for well over fifty years at about fifty-percent less costly as the excavation method. It can also be installed in as little as one day from start to finish. In comparison, the excavation method can take multiple weeks to complete. 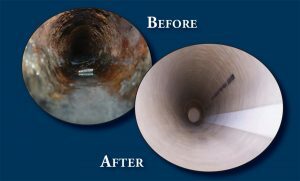 Nu Flow Technologies is proud to be the leading trenchless sewer repair expert in St. Louis, Missouri. If you are interested in a free estimate or would like to learn more about the process please contact us at your earliest convenience.